Girl, I'm feeling like Dionne Warwick or Miss Cleo because I swear I'm getting my 'Pyschic Friend' on. I've been predicting this was going to happen ever since Iyanla and Oprah reconciled. It just made perfect that Iyanla would get her own show on OWN. You can say what you want about Iyanla, but she and Oprah have made television magic together and hopefully they can do it again with her new show entitled, 'Iyanla Fix My Life'. Look I'm always going to be on Team Oprah. I want the woman to succeed and I think giving Iyanla a show is going in the right direction. "...After much prayer and conscious consideration I am choosing to move forward with this project as my next step in service to the world. I am so humbled and grateful to have this opportunity to do what I love; on a network that gives me the freedom to be myself; working with people who value what I bring to the table; offering to the people I love (that would be you) a consistent dose of something I believe will facilitate and support the personal growth and spiritual evolution of individuals, families and communities. Enjoy as I share this part of the journey with you. I invite you to join me on OWN when the show airs later this year. We'll let you know as soon as we have an idea of when that will be! Love, Iyanla "
I believe there is a time and place for everything. 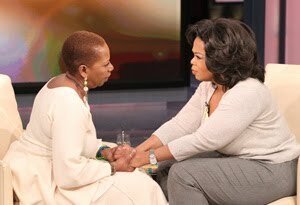 I don't think Iyanla would have had the type of show she's going to have when she first got with Oprah. Iyanla had started to believe her own hype and that's why she left Oprah for Barbara Walters. I think she's gotten to a place of humility and now she's better able to share her gifts with the world and truly be that teacher that she is meant to be. The sista is a powerful woman with a vast wisdom to share. I look forward to watching her on OWN. I said I dont do much cable - its too expensive, and I heard that the Oprah Channel costs an extra $10 on top of the cable rate.